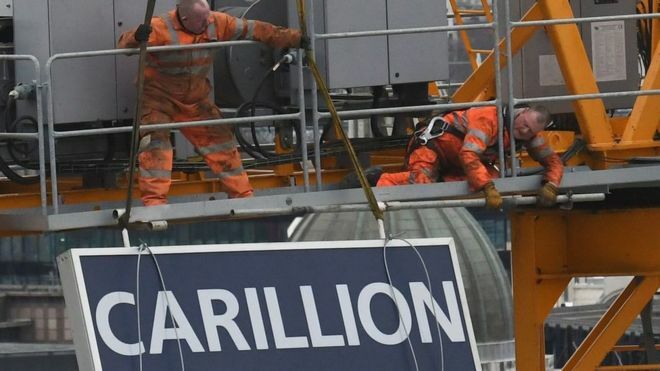 Nearly 380 workers at Carillion are being made redundant, but the body in charge of liquidating the business said it had saved 919 jobs. The Official Receiver said that most of the people who have kept their posts are being transferred on existing or similar terms to new companies that are taking over Carillion’s contracts. However, it said that “despite best efforts” it was unable to secure 377 roles. Carillion went bust on 15 January. The Official Receiver said employees whose jobs have been safeguarded worked on infrastructure, central and local government projects, as well as on construction contracts. A spokesperson for the Official Receiver, said: “I recognise that this will be a worrying time for all those affected, their families and local communities. I would like to thank all staff for their professionalism throughout the liquidation. Carillion had employed 43,000 people, including around 20,000 in the UK. Since it collapsed last month, a number of companies have said they will take over contracts and projects that they had previously worked on with the now defunct construction and services business. Kier Group had been part of a joint venture with Carillion and French business Eiffage on the High Speed 2 rail project. Kier and Eiffage are now partners on the scheme and are taking on 51 Carillion employees. Kier has also assumed full responsibility for work on behalf of Highways England to reduce congestion on motorways, and is transferring about 150 employees from Carillion. What Do We Do With All This Money? What Happens in an Internet Minute in 2019?